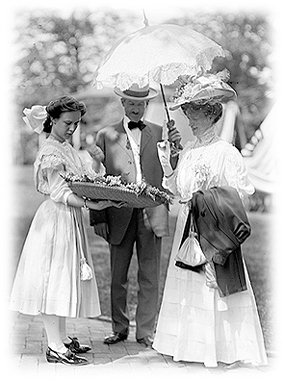 During the late Victorian era, an elaborate and lavish garden party was an entertaining social affair. England was considered the land for garden parties, with its turf of velvet softness, splendid old oaks, and its sculptured landscape gardening. It was difficult to locate places in America which offered the clipped-box avenues, the arcades of blossoming rose vines, the finely kept and perfect gravel walks, or, better still, the old-fashioned gardens overflowing with flowers. But there were some locations in America with a green lawn, a few trees, and (with the prospect of a sunny day) would be perfect for a garden party. 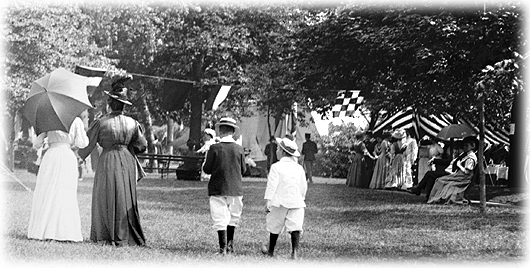 Garden parties were held at the grandest of Newport, Rhode Island’s mansions, at suburban “summer cottages,” and at the more local city outdoor parks. 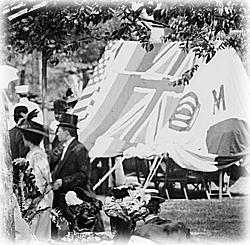 In the neighborhood of New York, very charming garden parties were given at the Brooklyn Navy Yard, at the headquarters of the officers of marines, and at the picturesque Governor's Island. The garden party was almost deemed a necessity up the Hudson River and all along the coast of Long Island during the summer months. The owner of a fine summer place was expected to allow those who must stay in the city at least one sniff of his roses and newly mown grass. The Breakers, Newport, Rhode Island. 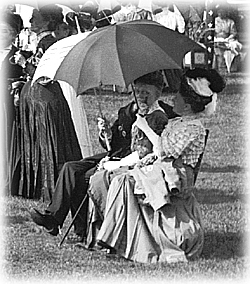 Taking it for granted that the garden party would be outdoors, the hostess received her guests on the lawn, wearing her hat or bonnet. The carriages, however, first arrived at the door so the ladies could go upstairs to deposit their wraps, brush off the dust, and rearrange their costumes if they wished. A servant would be in attendance to then show the guest to that part of the grounds where the hostess was receiving. Ladies always wore their bonnets at a garden party and, combined with their long dresses, made a charming panorama on the grass and under the trees. The proper garden party was always held entirely in the open air. It was usual to have a tent pitched where the refreshments were served — consisting of tea and coffee, bread and butter and biscuits, cake, sandwiches, fruit, claret-cup and lemonade, and of course the ices. Sometimes, however, when the event was not a very large affair, the tent was dispensed with, and the refreshments were placed in the dining room. If the weather was questionable, the hospitable hostess was prepared to have her table moved indoors so no guest would endure an unexpected heavy downpour, ruining fine silks and beautiful bonnets. Nevertheless, her broad piazzas were filled with chairs; Turkey rugs were laid down on the grass; and every preparation was made so that even the elderly and rheumatic could enjoy the garden party even if they preferred to be only lookers-on. A hostess would see to it that her lawn tennis ground was in order, her croquet laid out, and the archery tools all in place, so the various groups could amuse themselves at these different games. Sometimes ball games and races were added, and often a platform was laid for dancing. A band of music was essential to a very elegant and successful garden party, so the hostess would offer a variety of music, both formal and merry. Some amusements were always provided for the younger guests, such as croquet or lawn tennis. A very important element of success was to set up plenty of seats, the greater portion being arranged in the shade looking on to the croquet ground; and the others scattered about the grounds and piazzas. It was common to use sofas, arm-chairs, and ordinary chairs from the house, with basket chairs and garden seats intermingled with them. Often, in front of the seating, pieces of stair carpeting was placed in front of the chairs in case the grass was damp. If there was either a lake or river on the grounds, boats were provided. Caution was taken to have an experienced boatman on hand. It was considered bad taste to take children to a garden party unless they were specifically invited; it was thought that if the children were too excited they would greatly interfere with the amusement of those whom the party was intended. If the hostess wished to serve her menu outdoors, it was important that all her dishes were cold. In the summer of 1882, Harper’s Bazaar listed salads, cold birds, ham, tongue, pâté de foie gras, cold patties, salmon dressed with a green sauce, jellies, Charlottes, ices, cakes, punch, and champagne on the proper menu to offer. Also, a cup of hot tea in the house would always be offered to those who desired it. 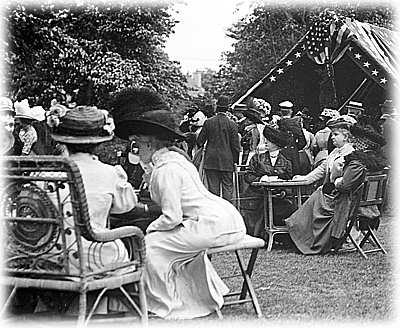 At Newport, some parties were generally conducted on the principle of an afternoon high tea. After the mistress of the house received her guests, they would wander through the grounds, and then come back to the house for refreshments, often sitting down at an opulent table in different groups. Here they would be served the pâté de foie gras, sandwiches, cold birds, plates of delicious jellied tongue, lobster salad, and even sometimes hot cakes and hot broiled chicken. Coffee, tea and wine were also offered. 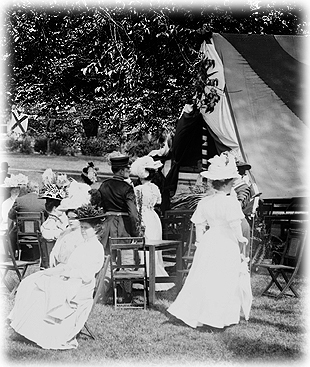 What's more, during the late 19th century, there were various public garden parties which were held on semi-official occasions, like the laying of a foundation stone for a public building, the birthday of a prominent individual, a Sunday school festival, or an entertainment given to a political official. These were banquets, and for these affairs the invitations were somewhat general, and would be officially issued. In remote country places ladies learned how to give a memorable garden party through ladies' magazines, and, with very little trouble, would make the most of the fine summer climate. 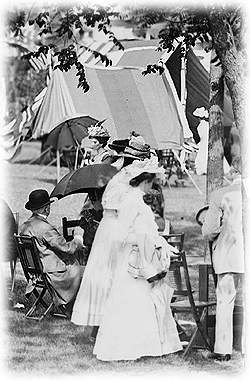 Lawn tennis played a large part in making the garden party a favorite means of entertaining. Deprived of the shelter of a house, a new garden party guest would wander about, not knowing exactly what to do. A well-prepared and gracious hostess would soon suggest that a croquet or lawn tennis party be formed, or announce that archery was set-up or that a ball could be thrown, or even that a card party or a game of checkers could be played under the trees. Victorian servants were instructed to preserve the proprieties of a proper dinner—even if the meal was served under the trees. There would be no piles of dirty dishes, knives, forks, or spoons visible on the green grass; baskets would be in readiness to carry off everything as soon as discarded. There would be a sufficient quantity of glass and china in use, and plenty of linen napkins, so that there need be no delay in serving the refreshments. The lemonade and punch bowls would be continually replenished from the dining-room, and a set of maid-servants, in caps and aprons would watch the table, noticing if the cups, spoons, plates, wine glasses, and forks were abundant and clean. If tea was served, maid-servants were careful that the tea was hot, and the spoons, cream, and sugar were available. Fruit was a great feature of garden party entertainment—melons, peaches, grapes, strawberries, were all served throughout the season. When strawberries and cream were served, a small napkin was placed between the saucer and plate, and a dessert spoon and fork was handed with each plate. In addition, ices were served in small paper cups placed on the ice-plates at garden parties—a method which was very convenient and mess free. Numbers of small tables were set up with camp stools, and then placed at convenient intervals, where the guests gathered round to deposit their plates. Claret-cup, champagne-cup, brandy and soda-water were all provided on a separate table for the gentlemen. Although a gentleman could step up to this table and help himself, it was necessary to have a servant in attendance to remove the wine glasses, tumblers, and goblets as they were used, and to replenish the decanters and pitchers as they were emptied, and to supply fresh glasses. Many hospitable hosts offered old Madeira, sherry, and port at these garden parties. These decanters were placed on the regular luncheon table, and glasses of wine were carried to the ladies who were sitting on the piazzas and under the trees by servants on silver trays. Small thin tumblers were used for the claret and champagne-cup, which was served in silver or glass pitchers. No lady used her best glass or china at these at outdoor entertainments since it would be sure to be broken. It was better to hire or rent all the necessary glass, silver, and china from the caterer, as it saved a world of counting, washing and storing. The servants who carried the refreshments from the tent or the table where they were served were instructed to be very careful in this part of the service, as many a fine gown had been ruined when a servant overturned a dish of strawberries and cream or a glass of punch or lemonade on a beautiful silk dress. Even though a garden party was a slightly intricate affair, particularly when the refreshments were served outdoors, it was always very beautiful and very amusing, and worth all the trouble. 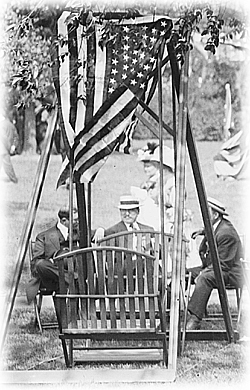 IMAGES: All images are from photographs of a garden party at Governor's Island on May 27, 1908; and from the Library of Congress Prints & Photographs Division.